Re-branding is a broad term. For some it’s a logo change and for others a complete re-addressing of the company ethos and image. It can even be as simple as changing a positioning statement. Think of your first car for instance: Was it a classic that still looks great today and is filled with character? Or is it just out-of-date and no longer relevant to you? Brands are much the same! There’s the Nike’s, Coke’s and Apple’s of the world who seldom change their logo as they’re so well recognised they hardly dare change it (although if we look back they have all clearly tweaked their logos in some form, though only noticeable by comparison) – What they all do however is regularly re-invent their brand. Others completely re-invent their image to adapt to industry and market changes. Branding is all about how you would like to be perceived by your target audience; understanding buyer behaviour as well as current and future trends. We often strive to create an emotional link with a brand, and it’s that emotion that drives our decision making when considering a purchase or recommendation. This is why many brands focus on creating an emotional connection with their target audience. The use of words like “You” , “Your” , “Be” and “Think” are incredibly prevalent – mostly because they single out the consumer as an individual, assigning them ownership of the brand. Following this we then often see a word that allows the consumer to identify with the brand. Words like “Different” , “Smart” , “Happy” and “Life” are commonplace. Put together we get slogans like Apple’s “Think Different” , Kodak’s “Share moments. Share Life.” and Coke’s “Open Happiness”. There is also a very obvious domino effect with re-brands. When an industry leader makes the decision to re-brand, their competitors often follow soon after in an effort to stay relevant and promote their own point of difference to the market. It’s a brave company that sees their competition evolving around them without making some changes of their own! An example of this recently occurred in the US with most of the major fast food brands undergoing varying levels of re-branding, each focusing on simplifying their logo and identifying more with their customer. (Did you notice that McDonald’s and KFC no longer have their name in their logo?) Visit: mcdonalds.com.au and kfc.com.au to see for yourself! So when is the right time to make a change? Is it the generalised and somewhat arbitrary “3 year cycle” everyone talks about? We don’t think so. Instead, we like to take a more focused look at your business to understand your target market and future goals. Often the re-brand strategy is sparked by the need to respond to internal or external pressures as mentioned above, not just the need to “look good” (although there’s no denying that helps!). 1) Does your company differentiate itself enough from its competitors to stand out in a crowded market? 4) Are you taking on new markets or audiences? 5) Does the company suffer from a negative image problem? 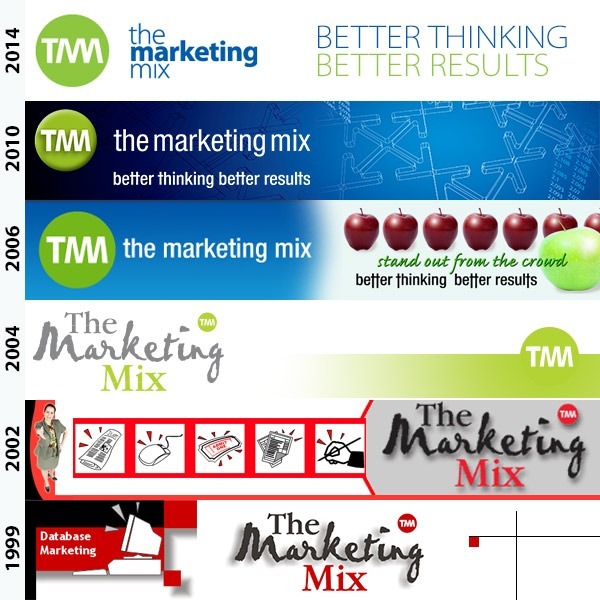 If you’ve answered yes to any of the above, you likely have a good case to look at changing your branding; and of course The Marketing Mix can help create a total brand solution! Talk to your Account Manager about arranging an obligation free consultation and see how our better thinking gives you better results. (See what we did there, putting “You” into our slogan? ).